Morebeer! recommends using the "double boiler method." This process involves using a boiling water bath on the outside of the flask to heat up the water inside the flask. All you need is a kettle 3 gallons or larger. This process is much safer and efficient. If the flask should break or boil over, your kettle will be there to collect the contents, thus keeping your stove clean and keeping you away from potential harm. I want to make yeast starters. The Erlenmeyer flask lets me boil and pitch with a single vessel. Recommended by fellow brewing friend. What size bung for a 2000ml flask? BEST ANSWER: Hi Vincent - #9 or #10 stoppers will fit the 2000mL flask. Perfect. Can boil in it, no issue. Great addition to my home brewery. Well made. Nice smooth bottom as to not throw stir bar. Works well with water, now to throw a starter in it and see how it does. this is great for making starters! Sturdy construction for heating on stove. Only challenge is finding a bung/stopper to fit for airlock. I'm guessing that at least 50% of home brewers use a stir plate when making starters. These flasks are unsuitable for that purpose because their bottoms are not flat. They are curved and cause the magnetic capsule to throw to the edges of the flask. In all other respects they are sturdy and useful, but if you have a stir plate, you will be very disappointed. Love this flask, it's very thick and well made. No issues heating to a boil directly on a gas stove. Works as advertised, great size for a large starter, which is great for higher gravity beers. Shipping was quick and easy! I've had no problems with this and its big enough for all but my biggest yeast starters. High quality, handles wide fluctuations in temp changes well, which is what you really need from a starter flask. I've been using these for years & this one from More Beer does the job. Tempered glass helps it last a long time, as long as I don't burn the bottom! I bought 2 after I broke the one I had for years. Works as designed and the best price I found for this size. If I'm doing a 10gal batch, I use two of these. Its definitely nice to be able to do starters in a single vessel and avoid additional opportunity for contamination by transferring to another vessel. Handles going straight from a boil on the stovetop directly into the freezer to cool down before pitching yeast. I was looking to start using a stir plate. This is what I needed! Good price and great shipping speed! The bottom of this flask is not flat. This makes it susceptible to bar throwing. I have a larger flask that has a nice flat bottom and does not have this problem. Not happy. I bought this to make yeast starters. I works great. Just a heads up though, if you fill it to the level you want before you boil the water, there will be MUCH less. Yeast starters make all the difference. I really didn't get my beers to turn out properly until I started making a yeast starter. This flask makes it easy. Proper size for a 5 gallon batch. and great quality for the price, too. Really sturdy flask that I use for all my yeast starters. Just my little tip on starters, I start to boil the DME/water mixture in a large pot so that when the hot break (yes, you still get one with DME) happens it won't make a mess. After the hot break, I pour the wort into this flask (using BE490 funnel) and top off with a little more boiling water. And then, since it's borosilicate glass, you can move it from the boil into a cold water bath for cooling. This is my go-to flask for starters, and it has always performed exactly how it is supposed to through about 15+ batches so far. One of the best priced value flasks available! Not the greatest gradation marks but great value for the price. I bought this flask after I accidentally broke another flask I had. This flask is much thicker and more sturdy than the other one I had. I'd only buy this flask if I need another one. The markings may be coarse, but it does the job just fine. Do not heat the glass directly! As it is smooth glass there are no areas for cavitation, so you can get superheated water (higher than 212F) that will immediately boil if you put in a spoon, stirrer, sugar or anything else. Use caution, as that is a great way to get a very bad burn. This is a solid basic erlenmeyer flask. It is inexpensive, but does the job, and fits on a stir plate nicely. I use it for all of my 5gal ales under 1.080, otherwise I use the 5L flask. This works well for small starters, but if you're doing a big beer, you will want to up-size or you will have a mess on your hands. I have used this directly on my stove burner and gone directly into an ice bath without any issues. Half a pound of DME and 1800 ML of water and you are good to go. If you have extra money to spend get the larger one and you won't have to worry about boil-overs. This is really a great flask. Makes yeast starters so easy and protects against infection. I use mine with a stir plate and have had a lot of success. I did have to go to emergency one day after lifting it from the top with a cloth potholder. Boy that hurts. I need a larger starter than normal for a beer I am planning so I got this guy. Does the trick just fine. I placed mine on my gas stove for about 5 minutes then I placed it into my sink with cool tap water and it cracked. I now have one on order to replace it. The guys at MoreBeer was great to work with, and they told me they will send me out a replacement one at no charge right away. I have two of these. They are perfect for making the right size starter for 5 gal batches. If I do a big beer I just step it up a couple times. I've been making better beer ever since I got them. If you want a heavier flask you will pay much more. Mine is still going strong. Over a year now, I have 3. Lettering is still on them and they are not yet broken. does the job, nothing special about flasks in general but affordable one here. Not a one size fits all flask, but good quality. As I measure by weight traditionally, I don't mind the gradations in this flask. I'd say a good 75% of my starters are made with this flask, the rest need my 5L flask. I've had no fear if this flask breaking due to craftsmanship. Good for the Size but consider going bigger. As most people who edge into making yeast starters a 2000 ml flask is the logical first step. However, you will eventually find that this size is a little small for many starters as they will tend to overflow the flask. That being said, if you plan on making 2000ml starters often I would recommend a 3000ml flask or larger and not worry about "out growing" it in the future. essential flask for making yeast starters for all beers. i have found that you can prolong the life of a flask by putting a wash cloth down on the bottom of the sink and soaking it with hot water and setting it on this after the boil but before you fill the sink with cold water and/or ice. after all the glass is meant to resist the shock from hot to cold but one you introduce another shock to it like knocking it on the side or bottom of a sink it will certainly break. its not meant to resist multiple shocks to the glass in a short period of time. i have used mine directly on the gas burner of my stove and chilled it with no cracks or problems at all at least 20 time now. This product is sturdy and is a great size for making starters. You can place it right on the stove and boil away. I've never had any problems with it. This would be the basic size to start with if brewing 5G bathes. However, go ahead and get a 5L flask, you will quickly outgrow the 2L unit. Nothing special, great upgrade from my previous 1000mL flask. As the other state is a solid product, works as intended. Doing 5 gallon batches with flask will allow me to build starters for both low and high gravity beers within acceptable tolerance. As the description says, being made of borosilicate glass allows for quick cooling of the boiled wort directly in the flask without worrying about breakage. It has survived open flame, cool baths and some accidental rough handling. If you only make 1 liter starters, this is a perfect flask. 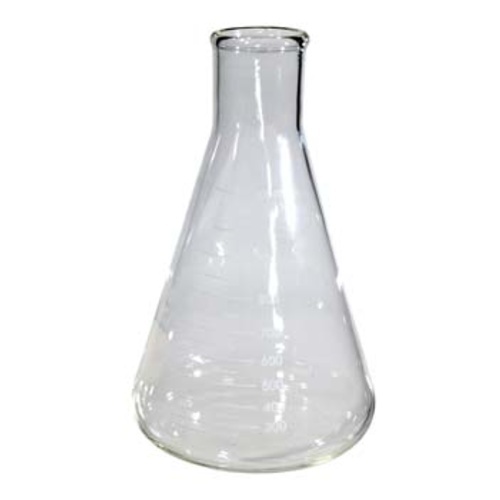 If you plan to step up yeast for huge beers, I recommend the 5L flask on this site. put it on your homemade stir-plate and your brew will be much more effective.